This is part 3 of our Payoneer Guide. Looking for part 1 or part 2? 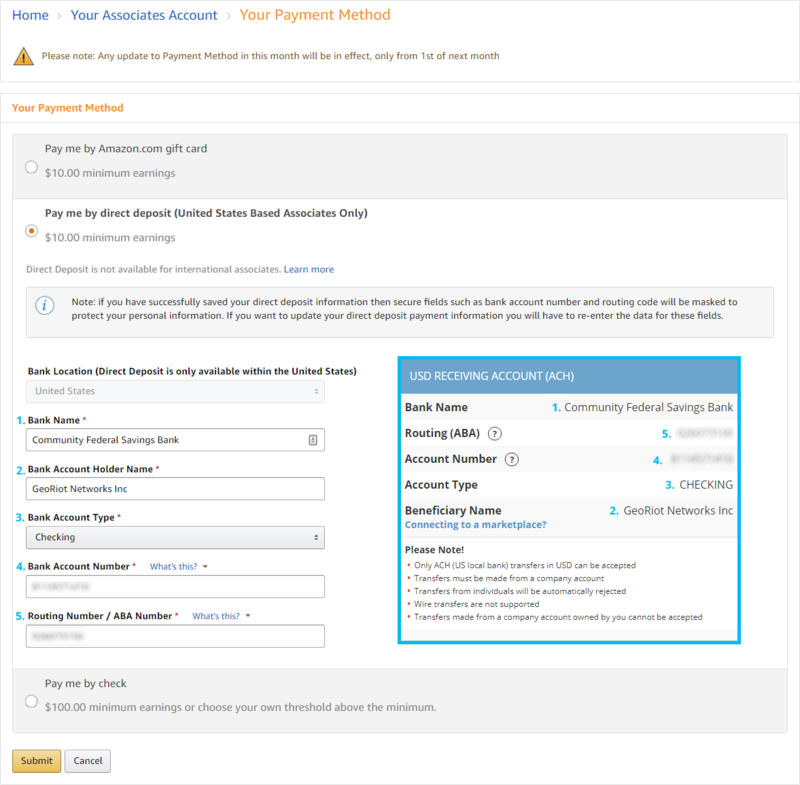 Here we cover how to set up your various bank accounts for each currency and configure your Amazon commission payouts. 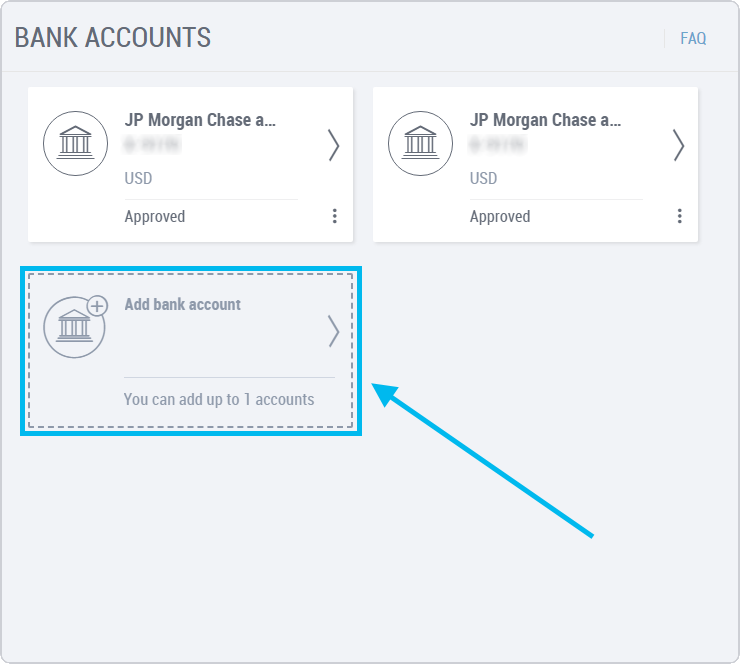 You’ll arrive on a page where you’ll be able to see your configured bank accounts. Click on “Add bank account” to unsurprisingly, add a new bank account. 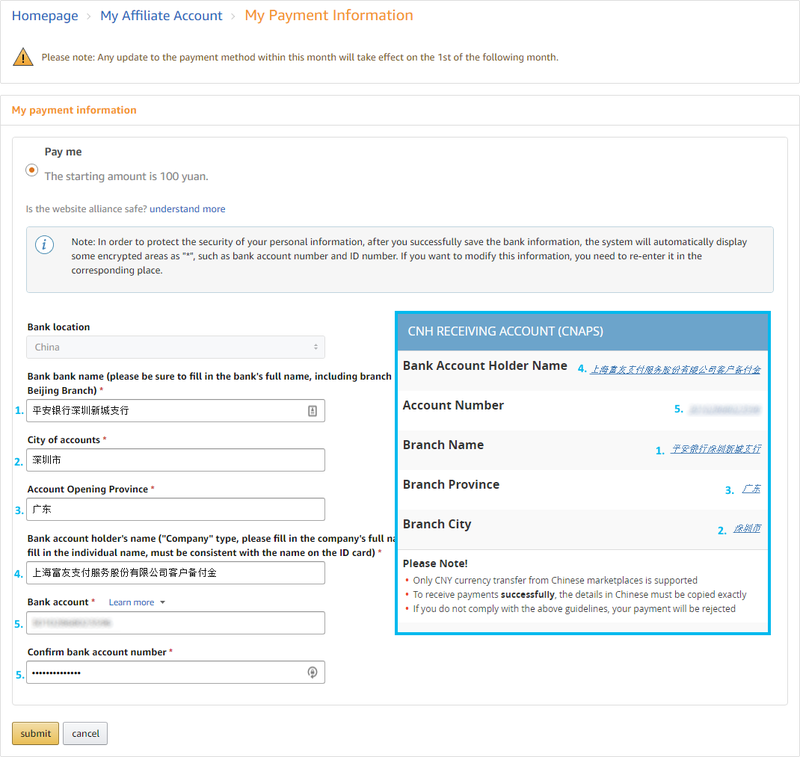 Once your Payoneer account is activated, or if you already have an active Payoneer account, then it’s time to log in to the Payoneer dashboard to get started on connecting your Amazon affiliate accounts. 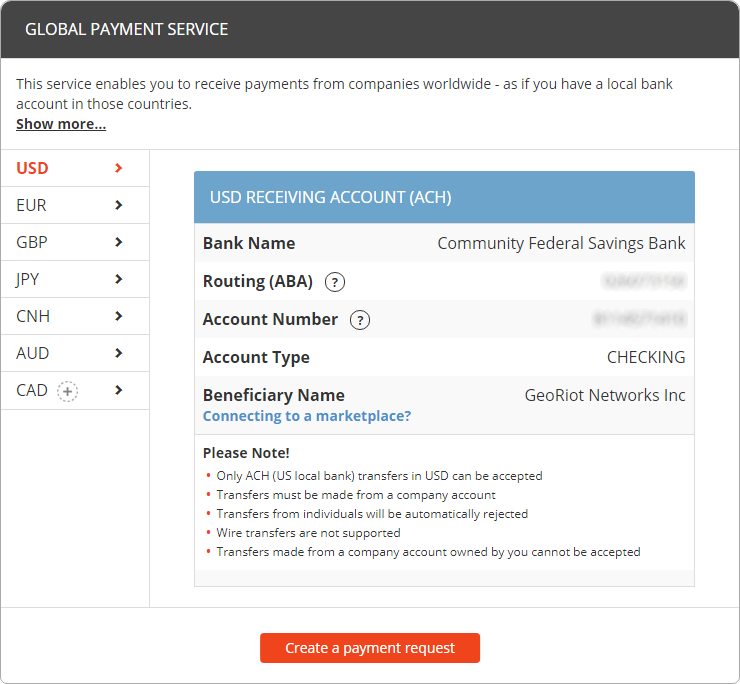 Click on “Global Payment Service”, and you’ll be taken to a page where you’ll find your USD receiving account (ACH) information. 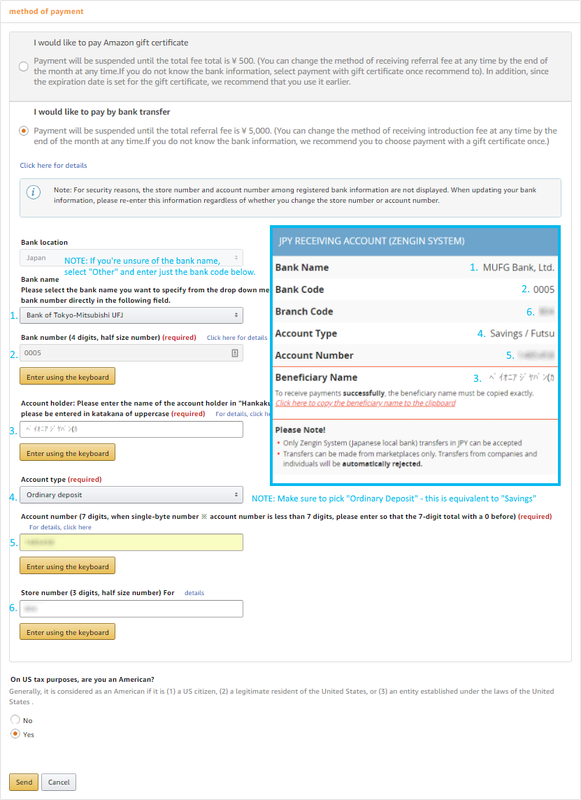 From here, select USD receiving account. The information you see here is what you’ll need to enter into your Amazon.com Associates Central affiliate dashboard to start receiving US earnings! To add your USD Payoneer bank details to your US/Amazon.com account, pull up a new browser window and log into your Associates dashboard here. Next, click on your email at the top of the page, and navigate to “Account Settings”. Next, click on “Change Payment Method” on the right-hand side of the options. 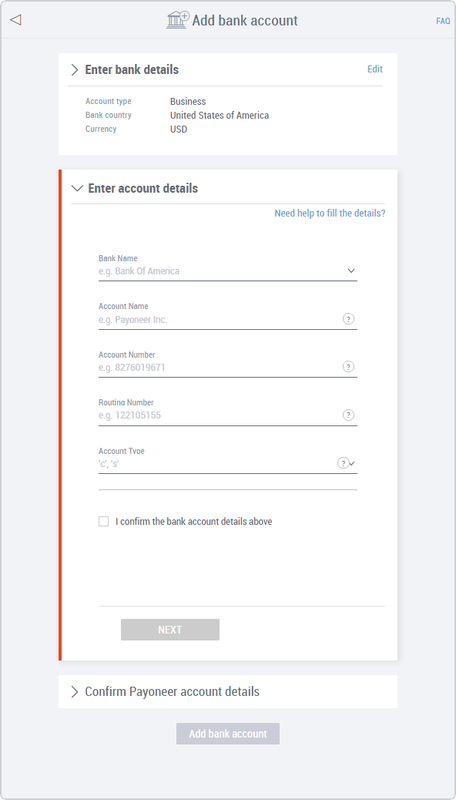 You’ll then arrive on the “Your Payment Method” page, where you’ll want to select “Pay me by direct deposit (United States Based Associates Only)” and then start copying and pasting over the details from the USD tab in Payoneer. Be sure to match the corresponding sections from the Payoneer page with the sections in the form. We’ve overlapped the important information from those two pages and numbered these in the screenshot below to help. Congrats! You are now set up to receive your hard-earned Amazon.com Associates program commissions from anywhere in the world! 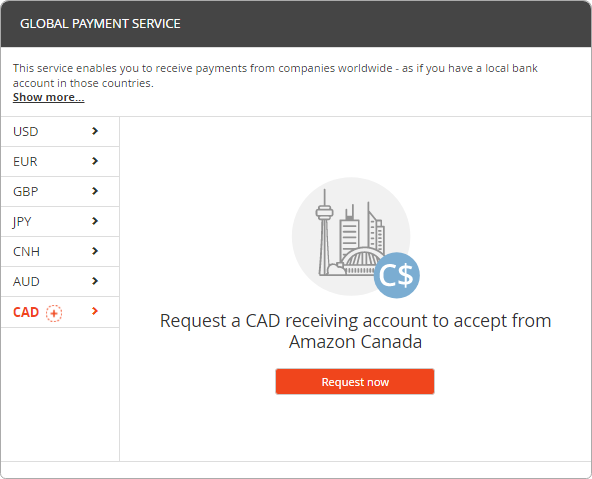 By default, your Payoneer account doesn’t support a “Global Payment Service” option for Canada so there is an extra step compared to setting up Amazon.com/US. 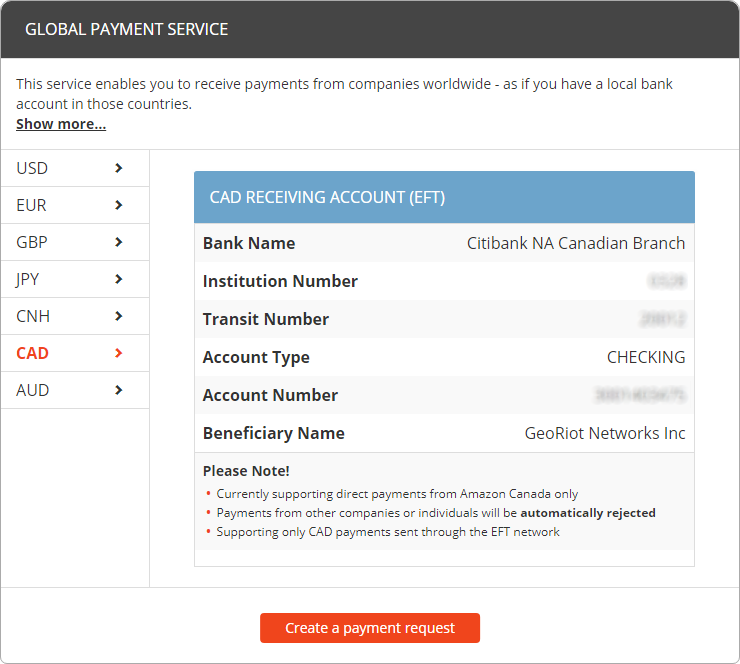 Start off by clicking the “Global Payment Service” icon on the main page or by selecting the “Global Payment Service” option under the “Receive” header. Next, click on the “CAD” option at the bottom of the list of currencies on the left side. From there you’ll have an option to “Request Now.” Clicking this button opens up a new tab and lets you apply for a new currency. After you’ve applied it may take a few days to be approved but hopefully, you’ll see an email like this shortly afterward. 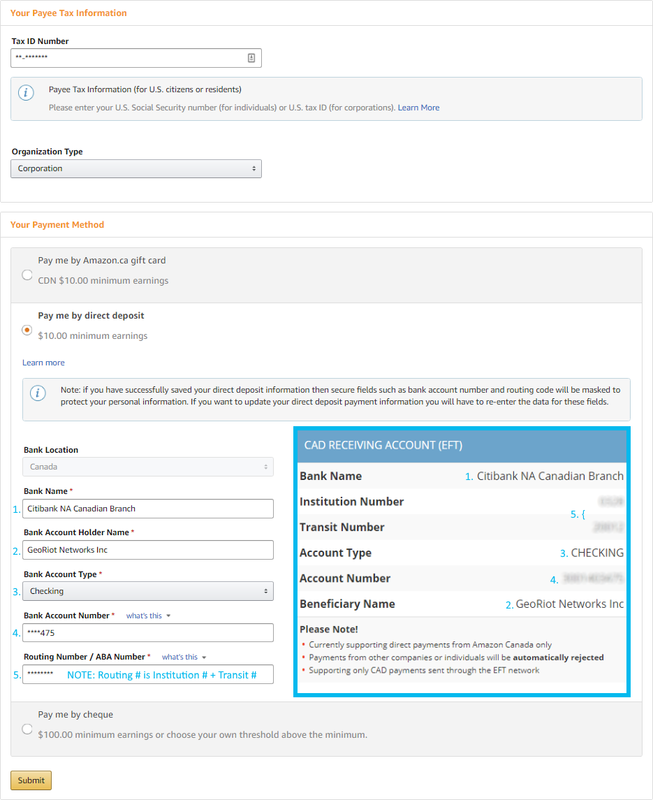 Once you’re approved, follow these steps to start receiving payments from Amazon.ca. 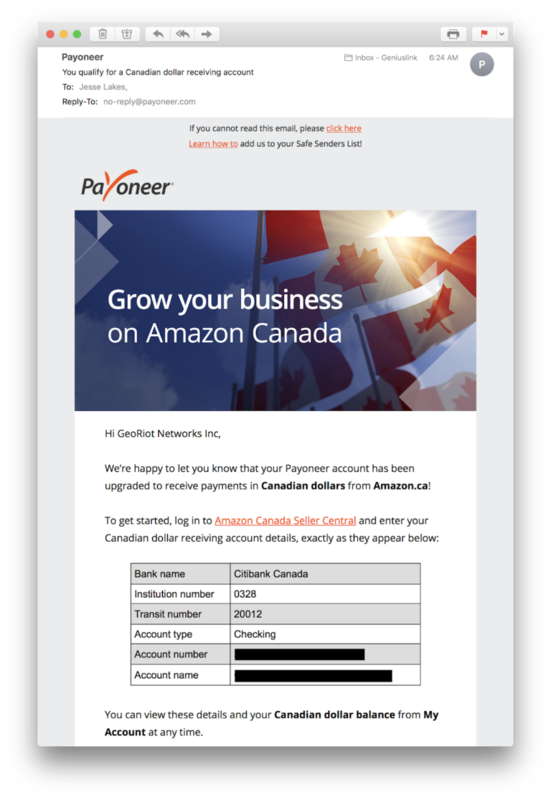 To add your CAD Payoneer bank details to your CA/Amazon.ca account, pull up a new browser window and log into your Associates account here. Next, click on your email address at the top of the page, and navigate to “Account Settings”. You’ll then arrive on the “Your Payment Method” page, where you’ll want to select “Pay me by direct deposit” and then start copying and pasting over the details from the CAD tab in Payoneer. Be sure to match the corresponding sections from the Payoneer page with the sections in the form. We’ve overlapped the important information from those two pages and numbered these in the screenshot below to help. Note: The “Routing Number” for “Citibank NA Canadian Branch” should be 032820012, but if your bank is different, you might try combining your Institution Number + Transit Number. 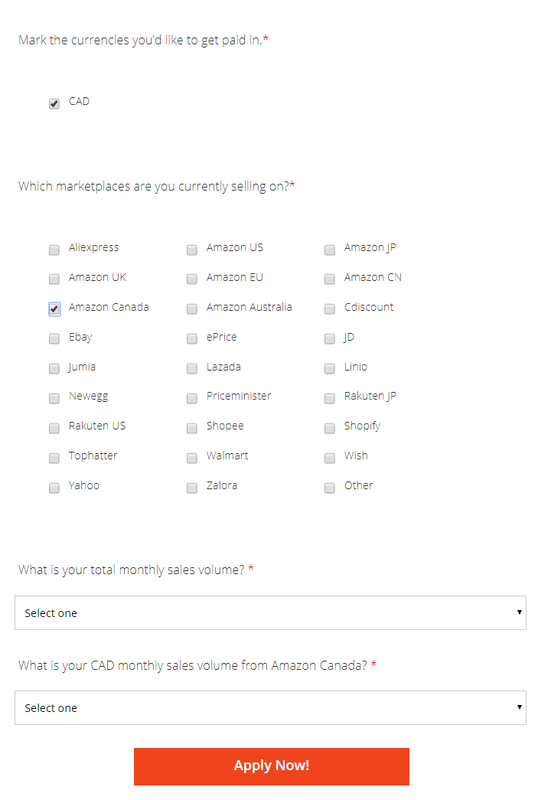 Congrats, you are now set up to receive your hard earned commissions from the Amazon.ca Associates program! 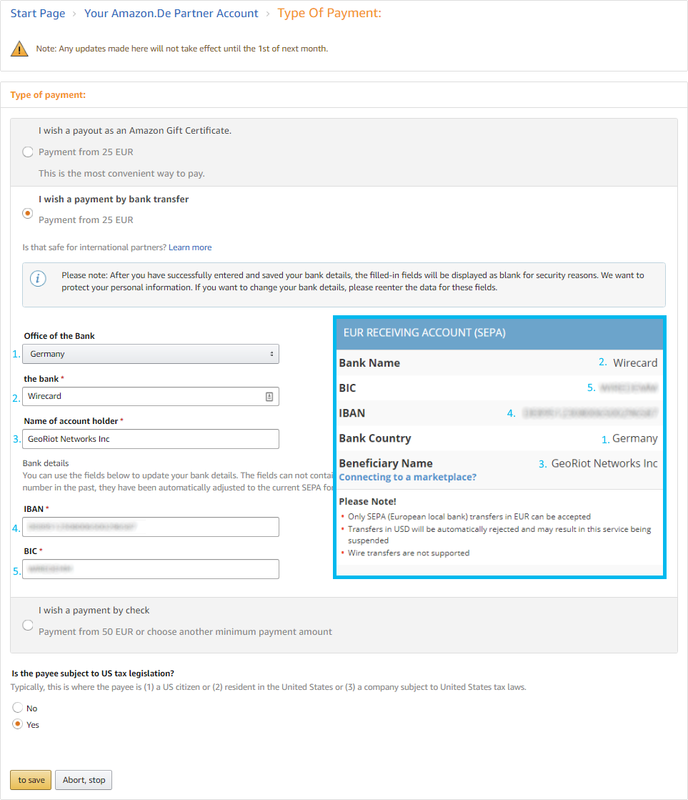 Setting up Amazon.co.uk with Payoneer is a unique case. We’ll start the setup like previous countries, but we’ll be using the EUR bank details with Amazon.co.uk, rather than the GBP details provided by Payoneer (explained below). From here, select the EUR receiving account. The information you see here is what you’ll need to enter into your Amazon.co.uk Associates account to start receiving UK earnings. Trust us! Note: The reason why we’re using EUR and not GBP for this setup is due to the GBP bank details provided by Payoneer do not match up correctly with the fields Amazon.co.uk uses for entering bank information. But the EUR ones do and the Amazon UK affiliate program allows you to use some international locations/banks for direct deposit. You’ll then arrive on the “Your Payment Method” page, where you’ll want to select “Pay me by direct deposit” and then start copying and pasting over the details from the EUR tab in Payoneer. Be sure to match the corresponding sections from the Payoneer page with the sections in the form. We’ve overlapped the important information from those two pages and numbered these in the screenshot below to help. Great, you are now set up to receive your hard earned affiliate revenue from the Amazon.co.uk affiliate program! Amazon Germany, France, Italy, and Spain all use the same EUR credentials from your Payoneer account, so we’ll demonstrate adding the details for one country for now. It’s also the same process as with Amazon.co.uk, so you can repeat the same steps as before. From here, select the EUR receiving account again. The information you see here is what you’ll need to enter into your Amazon.de (or amazon.fr, amazon.it, amazon.es) Associates account to start receiving those earnings. To add your EUR Payoneer bank details to your Amazon.de (or .fr, .it, or .es) accounts, pull up a new browser window and log into one of your European based Associates account (Amazon.de, Amazon.fr, Amazon.it, Amazon.es). Please note that each of the European Amazon Affiliate programs are in their local language. As the processes are exactly the same it’s fairly easy for us that don’t speak German, French, Italian or Spanish to navigate through BUT it is even easier if you use Chrome as your web browser as it has built-in translation support. This is what we’ve done to document the process for you so there may be a slight difference between our screenshots and what you are seeing. Okay, next you can click on your email address at the top of the page, and navigate to “My account”. Next, click on “Type of Payment” on the right-hand side of the options. This may differ slightly depending on the country (again, we’re using the build in translate feature in Chrome). Once you’ve completed these steps, you can repeat them for the remaining affiliate programs in Europe. You’ll still be using the EUR bank details so all earnings you receive from your EU Amazon accounts will be paid out to the same bank account. From here, select the JPY receiving account. The information you see here is what you’ll need to enter into your Amazon.co.jp Associates account to start receiving Japanese earnings. To add your JPY Payoneer bank details to your JPY/Amazon.co.jp account, pull up a new browser window and log into your Associates account here. Please note that the Amazon Japan affiliate program is in Japanese. As the processes are exactly the same you can test yourself by clicking in all of the right places BUT it is way easier if you use Chrome as your web browser as it has built-in translation support. This is what we’ve done to document the process for you so there may be a slight difference between our screenshots and what you are seeing. Okay, next you will click on your email address at the top of the page, and navigate to “Manage Account”. Next, click on “Payment/Change US Tax Information” on the right-hand side of the options. This may differ from what you see as we are using the built in translate feature of Chrome. 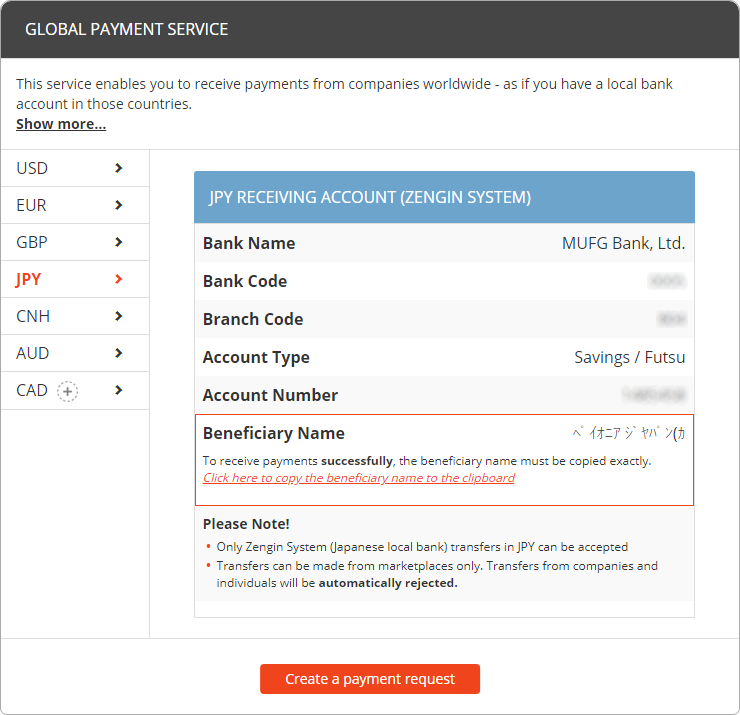 You’ll then arrive on the “My Payment Method” page, where you’ll want to select “Pay me” and then start copying and pasting over the details from the JPY tab in Payoneer. Be sure to match the corresponding sections from the Payoneer page with the sections in the form. We’ve overlapped the important information from those two pages and numbered these in the screenshot below to help. Congrats, you are now set up to receive your hard earned Amazon.co.jp affiliate commissions from anywhere in the world! From here, select the CNH receiving account. The information you see here is what you’ll need to enter into your Amazon.cn affiliate account to start receiving Chinese earnings. 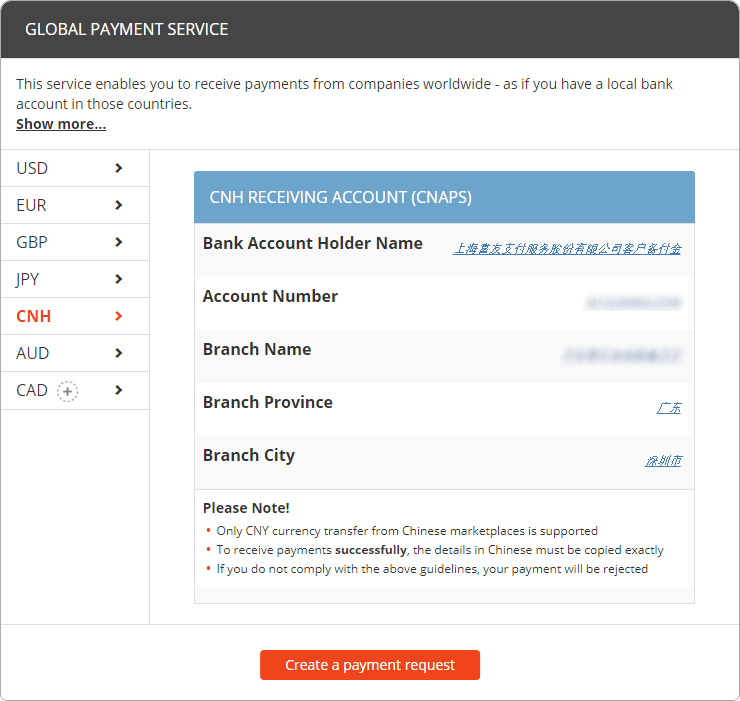 To add your CNH Payoneer bank details to your CNY/Amazon.cn account, pull up a new browser window and log into your Associates account here. Please note that the Amazon China affiliate program is in Chinese. As the processes are exactly the same as the previous programs you can test yourself by clicking in all of the right places BUT it is way easier if you use Chrome as your web browser. The Chrome web browser has built-in translation support. This is what we’ve done to document the process for you so there may be a slight difference between our screenshots and what you are seeing. Now that you are logged in click on your email address at the top of the page, and navigate to “Account Settings”. You’ll then arrive on the “My payment information” page, where you’ll want to select “Pay me” and then start copying and pasting over the details from the CNH tab in Payoneer. Be sure to match the corresponding sections from the Payoneer page with the sections in the form. We’ve overlapped the important information from those two pages and numbered these in the screenshot below to help. Perfect, you are now set up to receive your much deserved Amazon.cn commissions! Start off on the Payoneer dashboard by clicking the “Global Payment Service” icon on the main page or by selecting the “Global Payment Service” option under the “Receive” header. 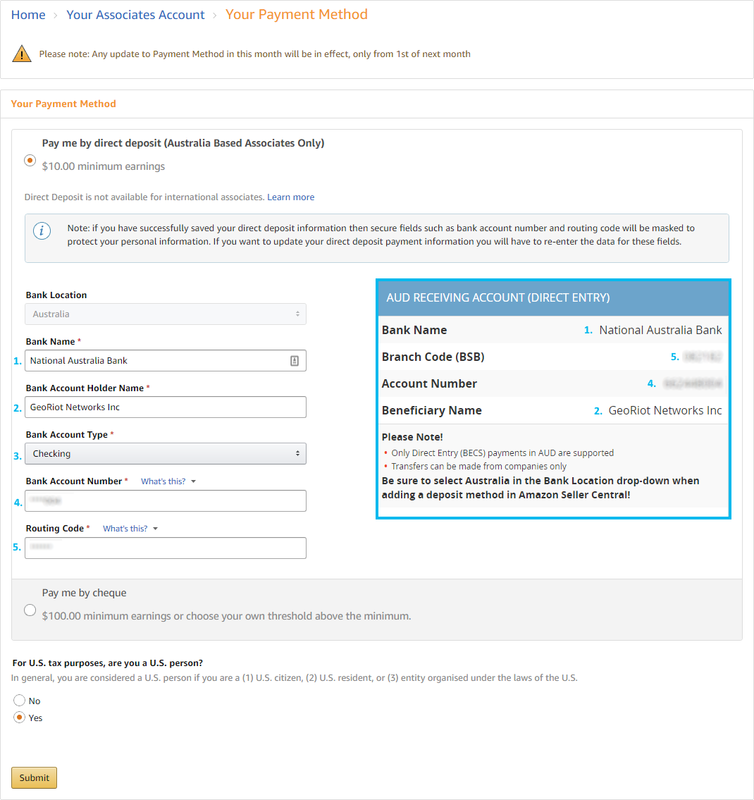 From here, select the AUD receiving account. 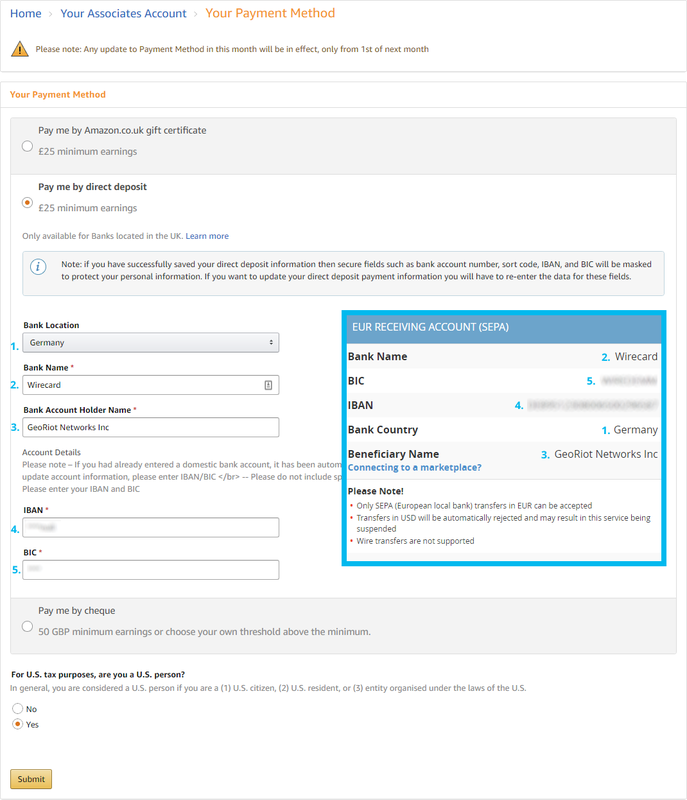 The information you see here is what you’ll need to enter into your Amazon.com.au Associates account to start receiving your Australian earnings. 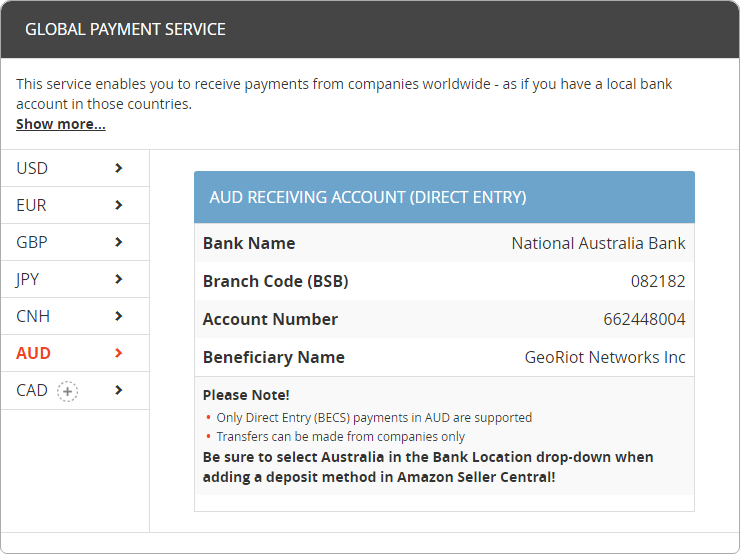 To add your AUD Payoneer bank details to your AU/Amazon.com.au account, pull up a new browser window and log into your Associates account here. Next, click on your email address at the top of the page, and navigate to “Account Settings”. You’ll then arrive on the “Your Payment Information” page, where you’ll want to select “Pay me by direct deposit” and then start copying and pasting over the details from the AUD tab in Payoneer. Be sure to match the corresponding sections from the Payoneer page with the sections in the form. We’ve overlapped the important information from those two pages and numbered these in the screenshot below to help. You did it, you are now set up to receive your much deserved Amazon.com.au affiliate commissions! Once you’ve earned your international commissions you need to get them into your local bank account so you can spend them. That last piece can be a real challenge but Payoneer has made it significantly easier. We hope this guide made it easy for you to get set up and running with Payoneer. Please don’t hesitate to share any tips or feedback on what might make this guide better in the comment section below. We’d also love to hear your success stories! How much revenue did you have sitting somewhere that you couldn’t touch until you got Payoneer set up? Disclaimer: It’s important to note that Payoneer offers an affiliate program and we are participating in it. The links above are affiliate links and in no way impact the taxes or fees associated with earning commissions using Payoneer.